This past weekend I had the amazing pleasure of attending an evening with The FourCoursemen. For all of you who don&apos;t know who I&apos;m talking about, The FourCoursemen are local chefs who run an underground supper club with a cult following—and they never make the same thing twice. The FourCoursemen was founded four years ago by Damien and Randy, two local web developers, who teamed up with a few of their very talented chef friends to start a supper club that would allow them to share their experiments— things like duck hot dogs and cuitlacoche (corn fungus) ravioli, with friends. Eventually they began making multicourse dinners for 24 guests, soliciting reservations online, and accepting donations for their hard work. They called it The FourCoursemen, and it has been a sensation ever since. The crew of the FourCoursemen includes Damien, Eddie (co-head chef at Farm255), Patrick (sous chef at The National), Matt (head chef at Farm255), Randy, and Nancy (their talented Sommelier), and they make beautiful music with food. The FourCoursemen is an underground sensation with limited means, which translates to "really difficult to get in to." The reservation process is extremely difficult as they only do dinners twice a month, and the reservations typically sell out within a minute of their opening. Thankfully for me, I have been following these guys for a long time and was waiting with fingers ready as the clock struck 11:30 a.m. on the day the email list instructed me to log on. Just as I expected, the reservation window lasted under 60 seconds, and thankfully my name got on the list. Since I made a reservation for 2, I invited my friend Mary (another local foodie who manages Transmetropolitan on Oglethorpe) to join me for an evening I was sure was to be full great food and great company. As instructed by the email, we arrived at the super secret location around 7:30 p.m. with wine in tow, completely unaware of the culinary journey we&apos;d be taking that night. When we arrived at the house, we were greeting by their friendly hostess, Erin, who took care to keep everyone&apos;s glasses full and faces smiling throughout the night. After pouring a glass of the Pinot Noir we brought for pre and post meal consumption, we mingled with the other guests who were just as excited as we were. Mary and I were by far the youngest attendees (both 22 year old recent college grads), and we enjoyed the eclectic group of people and interesting conversation. The crowd was mostly Athens locals between 22 and 60 years old, all with a passion for great food. One couple had trekked all the way from LaGrange for an evening they had apprently been waiting a long time to attend. As we we&apos;re instructed to take our seats around 8 p.m., our excitement built as our stomachs growled. After the guys introduced themselves (Nancy was out of town), they introduced the first course: Chilled Vidalia Onion Soup with Roasted Tomato, Crisp Lardo (similar to bacon), and Basil Oil. It was paired with a Pinot Gris, and the combination was magical. I had never tried chilled onion soup before, and it was beyond divine. The wine was perfect, and the soup amazing. As we all cleaned our bowls, they brought out the next course: a Watercress Salad with Housemade Ricotta, Local Green beans, Proscuitto, Tomato, and Lemon Chive Vinagrette. It was served with an interesting Savignon Blanc, and it was out of this world delicious. Round three introduced me to a fish we were all unfamiliar with, yet very intrigued: Sablefish with Roasted Patty Pan Squash, Eggplant Puree, Curried Carrot Cream, and Shallot Rings. It was served with a Chardonnay, and the combination of flavors with surprising, interesting, and genious. Our fourth course consisted of Quail Two Ways- Chicken Fried Breast &amp; Leg Confit with Sweet Corn, Arugula, Fresh Plum, and Plum Sauce served with a delicious Pinot Noir. To me, this dish was perfect. The combination of sweet and savory paired with the variety of textures made for a dish whose ingredients married in the most wonderful way. Even Mary, who admitted to typically not preferring such gamey meats, was converted after this dish. Perfection. 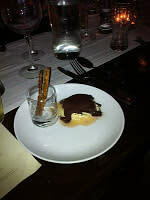 Our meal culminated with a dessert course that pleased the palate, cooled us down, and settled our bellies. We enjoyed a Spiced Banana Chocolate Ice Cream bar with Coffee Dust, Oatmeal Cookie Fingers, and Fruit Coulis served alongside a delicious Corn Whisky, which was, as Damien said jokingly, diluted with simple syrup and mint to make sure everyone made it home safely. They described the dessert as a play on a Klondike bar, and it was awesome. Simple, cute, and delicious. The perfect ending. After dinner everyone stayed and socialized for quite awhile, and we got the chance to chat with the chefs who had prepared us the delectable feast. They were all very interesting, friendly, and appreciative that others shared their passion for delicious, locally grown food. Although dinner was over around 10:30, we ended up sticking around till about 12:30 a.m., and we were among the first to leave. It was clear that the food was only half the reason The FourCoursemen are so successful, the other half being the generally great environment of the Saturday night feasts. If you&apos;re from the Athens area and love great food, you need to try to get on the list for this amazing supper club that has been praised by the likes of Food &amp; Wine Magazine. It was beyond worth the suggested $70 donation, and between the food and the great company it was truly one of the most memorable nights I&apos;ve had in Athens over the last four years. If you live in Atlanta or anywhere in North Georgia, it&apos;s worth the trek to Athens for a night. Click here to learn more about The FourCoursemen and see how to make a reservation.